I knew of David through the services we were providing to his family. David’s mother was very ill and in and out of the hospital when I first met them. Sadly she died and David and his older sister were without their Mother. While David was in his early teens, he came to stay with my family until we could help him and his 18 year old sister, who was now his legal guardian, get settled in a safe apartment. Soon after, a series of unfortunate events led to David being removed from his sister’s care, adding more trauma to his life. For a second time, my family welcomed him into our home with open arms, this time as his foster family. We always planned that he would move into a group home when he aged out of our foster care, but that plan changed when we knew our love for him had created a place in our own home for David to be a part of our family forever. Today, David is the youngest of my three children. He just turned 29 and has Down syndrome. To know David is to love him. Both mine and my husband’s family consider David to be part of their extended family. He has many aunts, uncles, cousins, nephews, nieces, a Granddad and a Grandma. He continues to have a close relationship with his biological sister. She has had the opportunity to get married, have two sons, and go to college. Even though I have worked in the field for over 20 years, my personal experience with David completely changed my view of the world of disabilities and forms my perspective on every aspect of our work at Access. On Saturday, May 28, David and I participated in an awareness event sponsored by the Down Syndrome Association of the Hudson Valley called Hands over the Hudson. This event, which took place on the Walkway Over the Hudson, featured activities and information tables on both the Highland and Poughkeepsie ends of the walkway. Despite the heat, the turnout was great. It was especially moving to see all the families with infants and toddlers. At the culmination of the event everyone gathered in the middle of the walkway to see old friends and make new ones, all while being over the beautiful Hudson River. We then all held hands and spread out on the walkway creating a mile long chain of people. This chain symbolized our connection and celebrated the possibilities for everyone. It was a fantastic experience increasing awareness of all we share; we think, feel, love, laugh, cry, wonder, dream and hope. The Down Syndrome Association of the Hudson Valley provides information, advocacy and services that promote the health, education, employment and inclusion of people in Hudson Valley with Down syndrome. I admire how they celebrate diversity while creating special community connections. It was an honor to be a part of the mile of connected people. On that day many connections were made; connections between old friends and news ones, connections between our community and the individuals who live here, and most important to me, a connection between my personal and professional life. 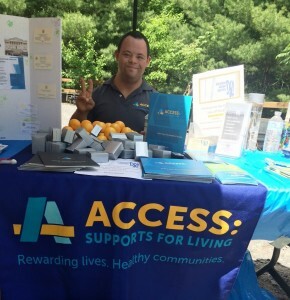 Both Access and the Down Syndrome Association of the Hudson Valley have made a commitment to make a positive impact on the communities in which we live. The collaboration and commitment between these agencies make me feel confident that David will one day live in a world where no one is marginalized because they are different, and full of communities that are welcoming to all. I’m an employee of Access, an organization that believes in possibilities and welcomes the opportunity of being a vital resource to all in the Hudson Valley. I am also a Mother, who believes that connecting and collaborating with others creates and weaves a strong community of leaders.